Can you believe it's almost Easter? All the little kidlets decked out in their new Easter duds searching for hidden eggs filled with candy - good times! You can always tell when Easter is right around the corner when you see the grocery shelves all lined with Peeps! I like the ones they have out that are completely chocolate covered. I have a couple of Easter cards to show y'all today. This first card was actually published in the March 2011 issue of CardMaker magazine. It's a gift card holder that looks like an Easter basket when closed. 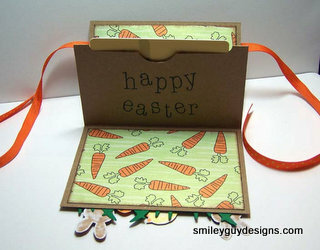 The bunnies, chick and carrots were stamped, colored with Copics and then cut out. The grass was cut using one of the 2x2 dies from Lifestyle Crafts (previously QuicKutz). The basket was made from two different colors of cardstock (kraft and brown) cut into strips and woven together in a basket pattern and adhered to the front of the gift card holder. To make the actual gift card holder you take a piece of cardstock 4.25" x 11" and score it at 3", 5.5" and 8". Fold along the scored lines in a valley, mountain, valley formation (accordian folds up and down). Adhere the center mountain section together along the left/right/bottom edges only - snip the top part open creating the actual pocket to hold the gift card. Here's a picture of the actual article. 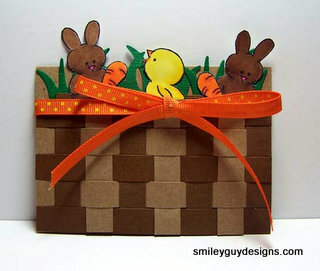 Now here's a picture of another Easter card made back in 2010 and submitted with the Easter basket card. Unfortuately it wasn't selected. I love all the colors used around Easter time - yellows, purples, blues....and of course Stickles is always a must! Bling never hurt anything! I believe the Spellbinders die used was from the Label One set. Of course the image was colored with Copics because I love, love, love my Copics. Even though my heart belongs to Copics I am trying to expand my horizons and branch out to include Prismacolor pencils blended with Gamsol as well as the new Tim Holtz Distress water markers. I must admit these other mediums are pretty fun to play with. On the second card,I'm pretty envious of your Copic rendering capabilities ;) I'd love to take that class I saw at work. And I see you're venturing out with Gamsol & watercolor pencils, and Tim Holtz's new markers. I do like the Gamsol. And I think I could definitely get used to T.H. 's markers!